NATURAL CHOICE Small Breed Adult Wet Dog Food Featuring delicious slices in gravy, NATURAL CHOICE Small Breed Adult Wet Dog Food is formulated to provide small dogs the nutrients they need to stay healthy and strong. Each tray of natural dog food is chock-full of protein, not artificial flavors, colors or preservatives. Please the Pickiest Pet with Our Wet Dog Food Have a finicky eater on your hands? NATURAL CHOICE Small Breed Adult Wet Dog Food is made with real meat proteins and other natural ingredients to win over your pet’s palate. This natural dog food also includes these key features: • Targeted nutrition for higher metabolism • Quality, natural ingredients • Healthy skin & coat Available Flavors • NATURAL CHOICE Small Breed Adult Savory Lamb & Vegetable Recipe Slices in Gravy • NATURAL CHOICE Small Breed Adult Chicken & Whole Brown Rice Recipe Slices in Gravy • NATURAL CHOICE Small Breed Adult Roasted Turkey & Vegetable Recipe Slices in Gravy Available Sizes • 3.5-oz tray click to view product NATURAL CHOICE WHOLESOME ESSENTIALS Adult Canned Dog Food NATURAL CHOICE WHOLESOME ESSENTIALS Adult Canned Dog Food contains optimal levels of linoleic acid and zinc for a healthy skin and coat. These formulas also include the necessary amino acids dogs need to build muscle and maintain a healthy metabolism. 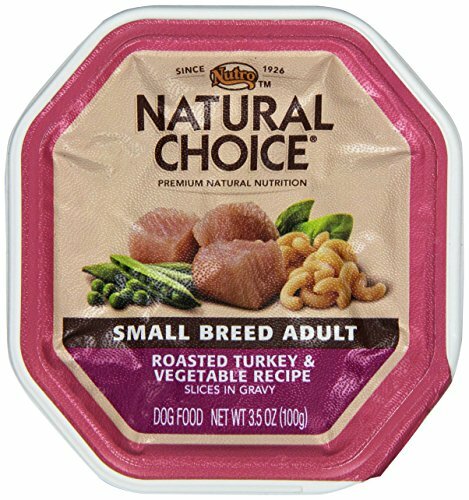 click to view product NATURAL CHOICE Small Breed Dry Dog Food Small breed dogs need a dry dog food specifically tailored for dogs of their small stature. NATURAL CHOICE Small Breed Dry Dog Food features a unique kibble shape designed to naturally reduce plaque and tartar buildup, and targeted levels of protein and fat for a higher metabolism. click to view product NATURAL CHOICE Sensitive Skin & Stomach Dry Dog Food NATURAL CHOICE Sensitive Skin & Stomach Dry Dog Food contains no corn or wheat, which are ingredients that may aggravate food sensitivities in some dogs. Our formula uses natural*, premium ingredients that are easy for dogs with sensitive stomachs to digest. *with vitamins, minerals and other nutrients click to view product NATURAL CHOICE Adult Dog Biscuits - Chicken NATURAL CHOICE Adult Chicken Dog Biscuits are made with real chicken to support lean muscle development and healthy mobility. Reward your dog with an all-natural treat they’ll love. 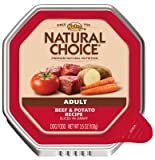 Features Type - Natural choice beef & potato dog food tray. Capacity - 3.5 oz. Dimension - 3.75 x 3.5 x 1 in. Item Weight - 0.24 lbs. 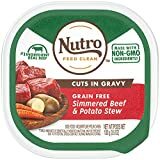 Nutro Adult Beef and Potato Recipe Slices in Gravy Dog Food contains no artificial flavors, colors or preservatives. Plus, we include real, great-tasting beef and optimal levels of linoleic acid and zinc for healthy skin and coats. It’s premium nutrition your Dog deserves for a healthy, happy and long life.